Experience a unique and refreshing way of learning Indian dance via online training from the comfort of your own studio space or home anywhere in the world. A professional development and training residency for established and emerging professional dancers of all genres, Indian and non-Indian dance systems such as Ballet, Western Contemporary, European, Asian, African or other Classical dance styles. SPECIAL NOTES: Fall classes also be offered. A reminder to all CADA members about the professional development reimbursement program to subsidize their class fees. 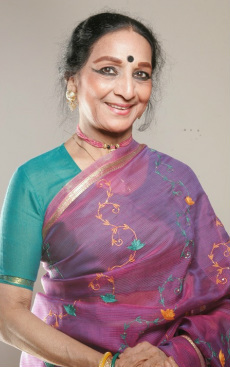 Based upon her over 25 year experience of teaching classical Indian dance to the students of the National Ballet School and York University, the Governor General’s Life Time Achievement Award winning renowned dancer, choreographer, teacher Menaka Thakkar has specially designed this in-depth introduction course (10 hours) for the benefit of any professional dancer or advanced student of genres such as ballet, western contemporary, Spanish, African, etc. This will be repeated in the Fall and followed in Winter and Spring by a higher level course. Brief Description - Bharatanatyam is one of the 8 classical dance styles of India. Its origin is very ancient. But its modern version was revived in the 1930s from what was practiced and performed in the temples and royal courts of the state of Tamilnadu in South India since the 18th century. Bharatanatyam is commonly known for is beautiful lines, fast rhythmic footwork, hand gestures, eye movements and facial expressions. There are 2 aspects to Bharatanatyam, the Nritta which is the pure dance movement and visual depiction of rhythms, and the second aspect the Nritya (Abhinaya) which is the dramatic art of story telling and poetry interpretation using body movements, eye movements, facial expressions and hand gestures. Today Bharatanatyam is one of the most popular dance styles of India and is performed worldwide by both Men and Women. Participants	Classes can be adapted to suit a beginner/intermediate/advanced level to suit training goals.